Renowned for its versatility, reliability, and value, the V-Strom 650 has attracted many riders who use it for touring, commuting, or a fun ride when the spirit moves them. 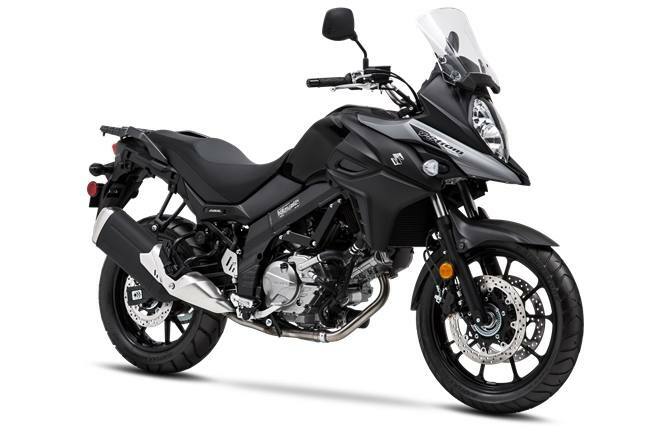 It is a touchstone motorcycle balanced with a natural riding position, comfortable seat, and a flexible engine character that produces stress-free riding during brief daily use or a high-mile adventure. The 2019 V-Strom 650 shares the profile of the V-Strom 1000, unifying the V-Strom family. This V-Strom has stellar engine performance and great fuel economy while achieving worldwide emission standards. A number of engineering accomplishments result in low weight and a thin chassis, producing a V-Strom that is more versatile, more controllable, and more accessible to elevate its total performance so it's simply “more V-Strom." And that's what a rider wants: more of a good ride. Liquid-cooled, 645cc, 90-degree, V-twin engine delivers strong torque in the low- to mid-rpm range, yet provides a strong rush of high-rpm power that's ideal for any riding mission. 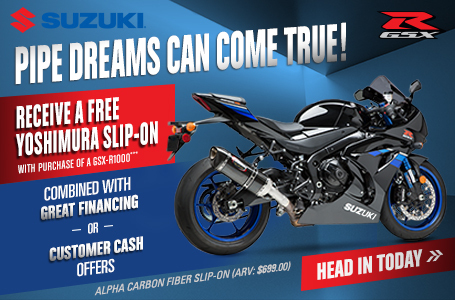 Suzuki's Advanced Traction Control System*, Easy Start System, Low-RPM Assist feature, plus ABS** technology make a great motorcycle really incredible. Multi-function, illumination-adjustable instrument panel brings a wealth of information to the rider in a concise manner and helps when setting rider-assist features. 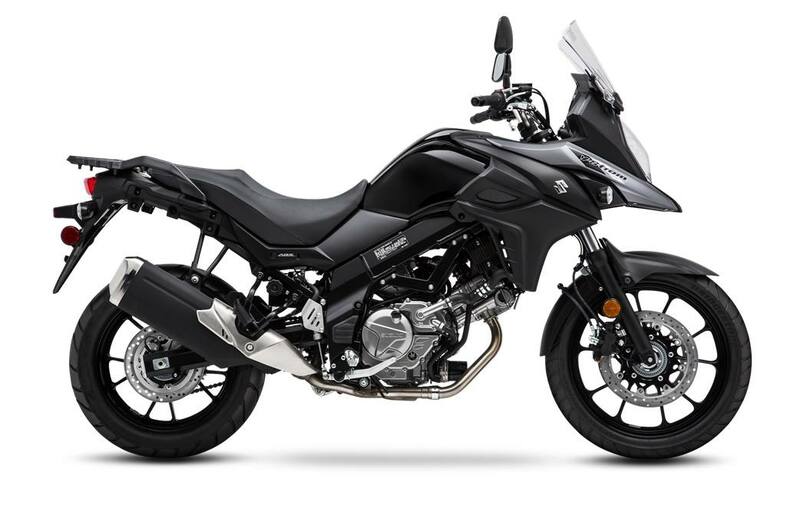 Strong and lightweight chassis has integrated mount points for unified Suzuki V-Strom luggage that's easy to clip on and off and keeps the motorcycle trim when ready for touring. Using SV650 engineering, the V-Strom 650's DOHC, liquid-cooled engine has been tuned to deliver clean, strong power at any rpm. The fuel injection system employs Suzuki's innovative SDTV (Suzuki Dual Throttle Valve) on 39mm throttle bodies. The secondary throttle valves are controlled by a servo motor for smooth power delivery. Suzuki's patented Throttle-body Integrated Idle Speed Control (TI-ISC) stabilizes the engine idle speed and helps lower emissions. The system is compact and lightweight. The TI-ISC on the V-Strom 650 has Suzuki's Low RPM Assist feature that seamlessly adjusts engine speed during takeoff and low-speed riding to smooth the power delivery. It also helps reduce the possibility of the rider stalling the motorcycle. The V-Strom 650 is equipped with Suzuki's Advanced Traction Control System*, which lets the rider control the throttle with more confidence in various riding conditions. It continuously monitors front and rear wheel speeds, throttle opening, engine speed, and the selected transmission gear to adjust engine output if wheel spin is detected. The compact radiator is flanked by wind-directing plates that enhance cooling efficiency and direct heat out of the side vents away from the rider's legs. The beak-style fairing, with vertically stacked headlights and a stronger internal structure, helps the V-Strom 650 cut through the wind, protecting the rider in style. Genuine Suzuki Accessories include side and top cases, engine guards, low- and high-profile seats, heated grips, hand guards, and more. *The traction control system is not a substitute for the rider's throttle control. It cannot prevent loss of traction due to excessive speed when the rider enters a turn and/or applies the brakes. Nor can it prevent the front wheel from losing grip. ** Depending on road surface conditions, such as wet, loose, or uneven roads, braking distance for an ABS-equipped vehicle may be longer than for a vehicle not equipped with ABS. ABS cannot prevent wheel skidding caused by braking while cornering. Please drive carefully and do not overly rely on ABS.